The Pitch: The game is an early-2000s looking screen with the police’s program open. A woman is interviewed 7 times by police, over the death of her husband. You can’t watch the tapes, but you can watch short clips from them, catalogued by her dialogue. The aim of the game is to watch enough clips to piece together the timeline until you’re happy you understand the story. 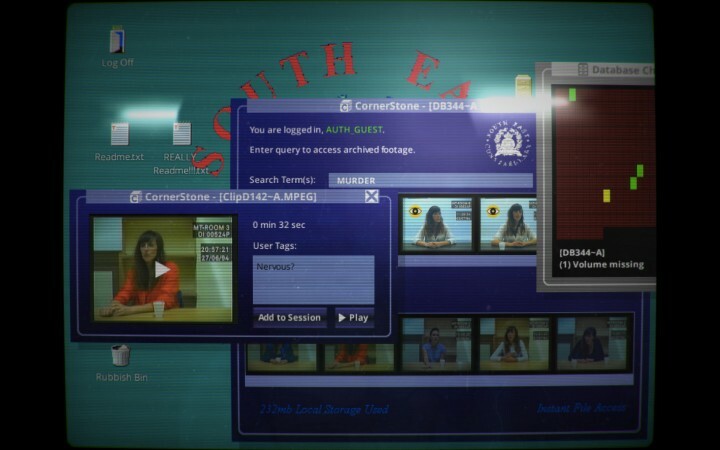 Gameplay: The first search quiery is already inputted “Murder”. Watching those clips gives you keyword nouns to send you on your way. What’s to stop you searching “confess” or “I did it” etc? Nothing, you can, but the game’s better made than that! The search only shows the first 5 results, sorted chronologically – i.e. random guessing will net you clips from early interviews. You’re going to have to be a lot more specific to get the juicy ones. After watching “murder” clips I immediately started typing in reasons for a murder, eg “cheat”, “money” etc. There’s some red herring clips in there that insult you for fishing, like “twins” brought up a clip saying “Twins. Are you serious? !” ha ha! I just wanted to speed-run it! The sequence of events is so twisted and convoluted, clips seen out of context (even directly about the murder) will trip you up until you piece together the timeline yourself, as single clips cleverly leave out some key bits of information. There is a database checker that’ll tell you when in the timeline the last clip you played was. When does it finish? Whenever you uncover something important, the lights will flicker, showing your face in the reflection, letting you know you’re going in the right direction. When you’ve seen ‘enough’ important clips, a chit-chat bubble will pop up asking if you’re good to go, but with either answer you can continue on afterwards to search for the rest of them. At the end of the credits, they give a new code to see the first 15 results (not just 5) to speed it up getting them. Acting: Viva Seifert, a British musician. One actress, 7 interviews; sometimes she’s acting like she’s acting/saying rehearsed responses, sometimes truthful, coy, reserved, bubbly, easy-going, cautious, stubborn….so it’s well played. It all makes sense in the whole story. It’s also fun to see the setup of 90s police interrogation footage. • This premise is perfectly suited and could only be done as an indie title, as the story couldn’t be bigger/more convoluted but still be manageable. • Being able to search for anything you want feels much more interactive and liberating than dialogue options you’d see in e.g. LA Noire or Fallout — you feel like much more of a detective this way. • They’ve cut out the interviewing officer’s speech, and it’s fun searching for terms you’d naturally expect him/her to pick up on to continue the interrogation. • There’s a few visual clues to pick up on (eg the beverage in front of her or distinguishing marks) but nothing you can’t get otherwise. • The “user tags” is not useful – just jot down your own notes separately! If you put something in the box it’ll show up when searching, and you want to narrow those searches! Same with “add to session” aka keep to watch again instantly. Overall: Thoroughly enjoyed! It’s unique and engaging, and requires no dexterity to play (just your wits!). I played it based on Mark Brown’s recommendation of Game of the Year (who makes the EXCELLENT GameMaker’s ToolKit YouTube series) and at the time of writing, it’s 50% off on Steam (€3!). (Clicky for GOG.com) So go buy it and lemme know what you thought! Don't read until after you've played! • There’s a YouTube video putting together all of the clips in chronological order when you’re done if you want to clarify anything. • There’s a laborious brute force method of seeing all the clips. Each clip has a “blank” user tag. Search for “blank” 5 clips will come up, you can delete the tag “blank” from each, then search again to get 5 new clips. This is the closest this game has to grinding and wouldn’t recommend but hey, sometimes you need to carve out that win! I did it to get the stragglers. • Link to Mark Brown’s spoilerrific break-down of the game. If you watch it tell ’em Jay from OSW sent you!